Who has time to make a Margherita Pizza when you work full time, have kids to take care of and laundry that’s been sitting in the dryer for 2 days. You do! 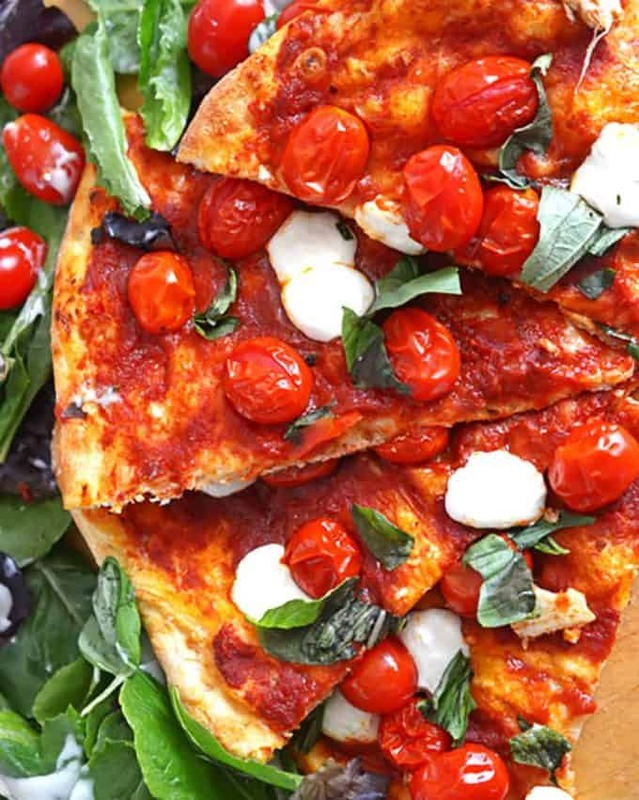 This easy Margherita pizza recipe is ready in under 30 minutes and you’ve probably already have most of the homemade pizza ingredients needed for this one. So turn your oven on and break out the pizza cutter, I know you’re drooling for a slice of this beauty! If you’ve ever wondered how to make Margherita pizza, you’ll love this easy homemade pizza recipe. Traditionally made with fresh mozzarella, fresh basil, and fresh tomatoes, the original version of this homemade pizza recipe was made for a queen. This easy Margherita pizza recipe is a simplified take from the classic version, perhaps easier, and definitely faster. I think it’s still fit for queen! 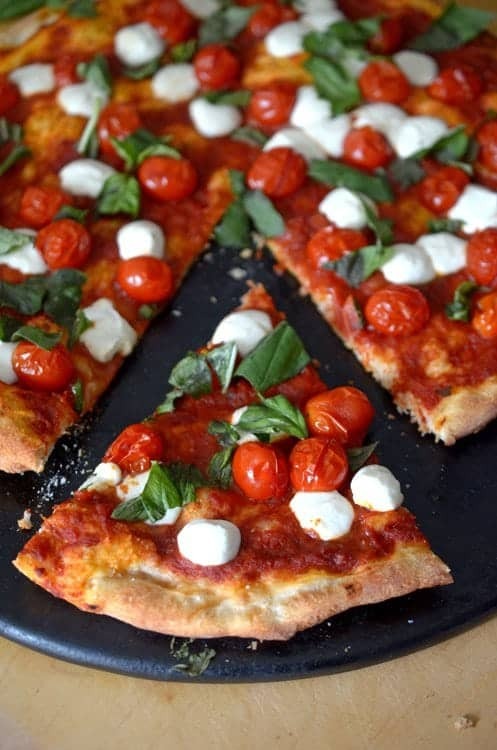 This easy Margherita pizza recipe can be ready in about 30 minutes. Easy and inexpensive, put this together in under 30 minutes for less than $10. This recipe uses just a handful of homemade pizza ingredients. It’s beautiful to look at, note it has the same colors as Italy’s flag! You’ll fall in love with the taste: Sweet, savory, and fresh on the palate. I put this homemade pizza recipe together on the fly, almost literally. I was amazed that I already had all the homemade pizza ingredients that I needed. Our BFF, Mike, is a commercial airline pilot and dropped by the cottage for a couple of days last week to do an education program at our kids’ school. Having no idea of what I would make on the first night he spent, I knew that our friend who may or may not have once asked me how to hard-boil an egg would appreciate anything that I could put together. 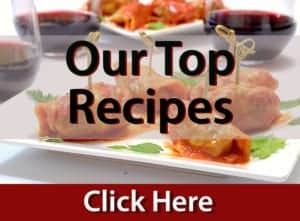 Grab this short list of homemade pizza ingredients and make this easy Marghertia pizza recipe today! To be sure, I had no intention of featuring this recipe on Platter Talk, not until I saw how pretty it was. Not until I tasted it. And not until I realized how incredibly easy this is to make. If you have wondered how to make Margherita pizza, I’m about to share with you just how to do it! 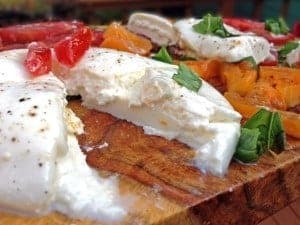 If you’re a fan of fresh mozzarella, you have to read about what we did with this burrata mozzarealla that we came across. It changed my life. We have been known to be pizza fanatics here on Platter Talk and up until recently we always made our own wonderful and simple pizza dough from scratch. Recently, after putting together our Crispy Chicken Cordon Bleu Stromboli, I decided to give it up and scratch the whole pizza dough from scratch idea. Remember that one? It took first place in the Tyson Chicken Recipe Challenge. I figured if a fresh pizza dough is good enough to win a contest like that, it’s probably good enough to use to throw a fast pizza Margherita together for my best buddy. I figured right. 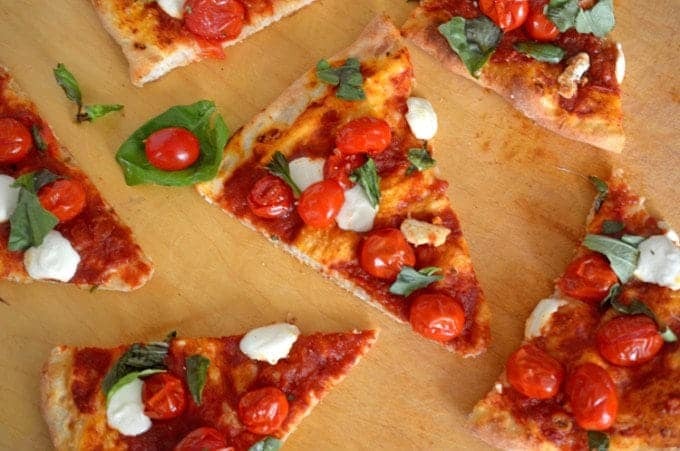 Want to know how to make Margherita pizza? 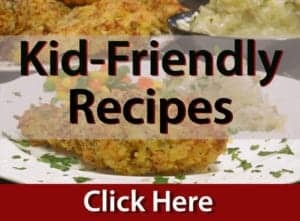 It’s easier than you would ever imagine! In lieu of fresh Roma tomatoes that are traditionally used on a Margherita pizza, I substituted some cherry tomatoes since there is no such thing as a fresh Roma tomato in Wisconsin this time of year. This proved to be an incredibly flavorful switch. My 500 degree oven effectively roasted these little cherry tomatoes, causing their skins to split, quite literally, making this pizza Margherita burst with flavor. 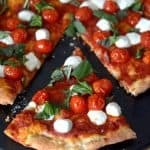 I put this great tasting and easy Margherita pizza recipe together for under $10 and spent only a total of 20 minutes from prep to finish. Now that Mike is very competent at boiling eggs, he confided to me that he will be taking this pizza Margherita (insert best Italian accent) recipe back to Denver with him. It’s that delicious. And that easy. 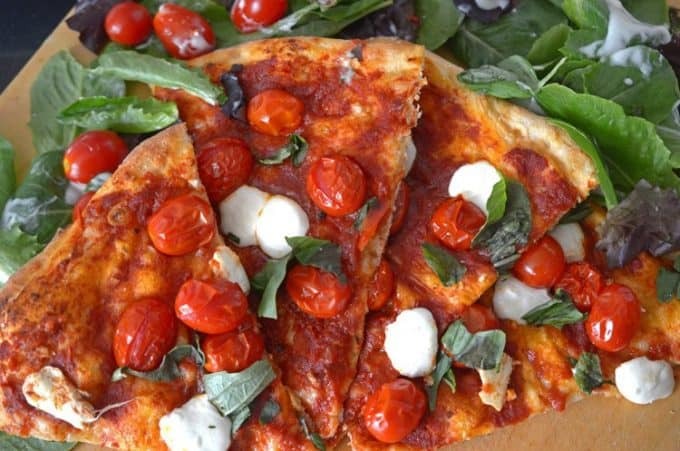 Try this Easy Margherita Pizza Recipe and be sure and let us know how you like it! It only takes a few ingredients for homemade pizza and if you have ever asked how to make Margherita pizza, then this is your recipe! 1 12 oz can crush tomatoes diced tomatoes, or tomato sauce. 4 oz fresh mozzarella torn in small pieces. 1 small handful fresh basil leave coarsely torn. With pizza stone in oven, heat oven to 500 degrees F.
If you are using a metal baking sheet, reduce oven to 425 degrees F.
Tear off a piece of parchment paper, approximately the same size as your pizza stone or pan. lightly flour the parchment paper, then stretch/roll dough out to approximate size of stone or pan. Use the back side of a spoon and evenly distribute canned tomatoes or sauce. Evenly distribute tomatoes and sprinkle with salt. Slice parchment paper (with pizza) on to hot stone place in oven for 15-18 minutes or until crust golden brown. Top with mozzarella cheese, immediately. Allow to set for five minutes, then evenly distribute fresh basil over pizza and serve immediately. 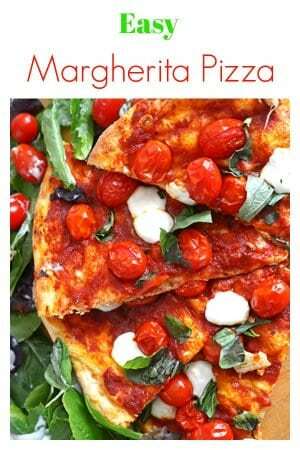 Pin this Easy Margherita Pizza Recipe for later! 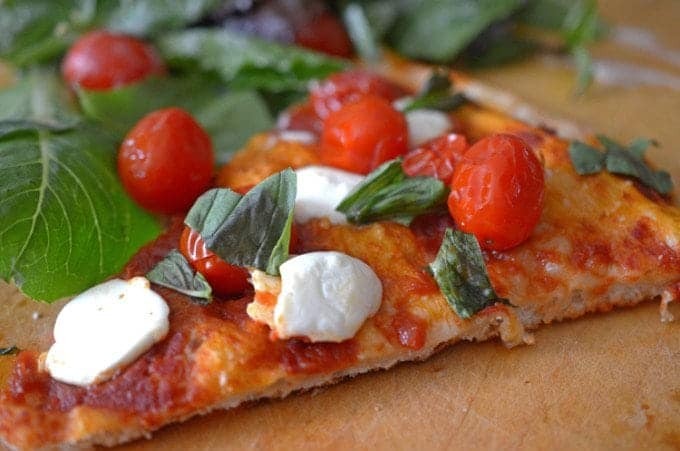 This is probably one of my favorite pizzas ever and your recipe looks delicious! I can’t wait to try it! Oh yum! It really does look beautiful. I always keep some of my homemade pizza bases par-baked in the freezer so I could whip this up in moments – and I totally will soon! we often buy prepared dough at the market as well. Saves time and you can keep it in the freezer. There is literally nothing better than margherita pizza! So delicious, fresh, and easy. Yours looks amazing! Looks absolutely delicious! You’ve created another winner here! Beautiful pizza! Absolutley love the fresh everything! I could so go for a slice of this now Dan! Pinned and shared! Ooooh…margherita pizza is my hubbie’s absolute favorite! I must surprise him with your gorgeous pie very soon! I really like the look of this with the cherry tomatoes and the cheese balls. Thanks, Peter. I think you will love the taste too! This is a simple, yet elegant looking pizza with all the best flavors and colors of Italian cookery. 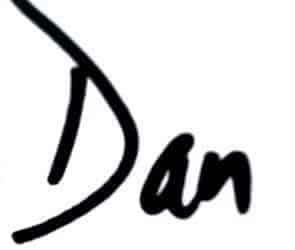 Wow Dan, you have outdone yourself. Beautiful pizza! Thanks, Sandi; I appreciate your kind words. I love everything about this recipe and those gorgeous bites of cheese. Of course, pizza is my favorite food anyway! Thanks, Erica; sounds like we are kindred spirits!